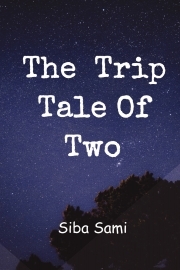 Description of "The Trip Tale Of Two"
Could love ever be forgotten? Riya and Alisha happen to meet each other when Riya arrives to Delhi from London. Riya has got a prejudice about love and relationship. Alisha on the other hand appears very peculiar to Riya. She is stuck in some endless sorrow. They share a tale. It erases the prejudice of Riya about relationship and Alisha escapes the endless sadness. How did it all happen? When one love can change whole of your life then one line, one name, one sight, one moment and one truth can take the breath out of you. Siba Sami is an English literature graduate from India. She is currently pursuing her masters. Being bitten by writer bug, Siba believes that pen and paper are the best tools to sculpt her thoughts and quench her creative thirst. She goes by the life mantra "Miles to go before I sleep". Reviews of "The Trip Tale Of Two"